The (Not So) Little Book of Surprises was twenty years in the making. My husband, Will Arntz, who created the film What the Bleep Do We Know!? 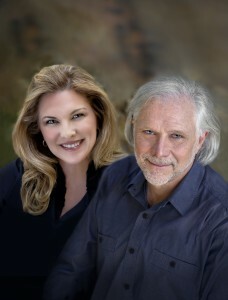 got the idea to take my poetic writing and the mystical transcendental experiences I draw upon when I teach, and combine with the photos of the award‑winning photographer, Endre Balogh, in a book – creating a journey of thought, a journey of the divine, a journey of wisdom. And when he came to me with this idea I said, “Great, let’s do it.” And then he said to me, “No, no, it’s not LET’s do it, it’s I’M doing it,” and he actually would not let me see what he was doing in the beginning. Because he made the successful film What the Bleep, I trusted his insight and intuition and I loved what he put together. He came up with the title The (Not So) Little Book of Surprise because he said this book is a Surprise! There’s not a book like this book anywhere in the world. You can look at just one page, read a few sentences and receive wisdom. You can experience the breathtaking nature photography. Or you can read the entire book in about an hour and a half, experiencing a journey as the wisdom story unfolds. Transformation and consciousness always comes in a Surprise! We can study, go to our place of worship, we can have a practice. But when those moments of awakening of awareness, the “aha”, when the world looks different…when That happens, it is always a surprise. Awakening comes in surprise moments. Since a very young age I have been visited by angels, saints and different illuminated beings. They speak to me, and I’ve seen them with my own eyes. At an early age I began to write down what they would tell me. These light beings feel strongly that they want their voices heard, because they want to bring hope. They want to share a map that will help us to get through our changing times with as much grace as is available. This map is inside of us. 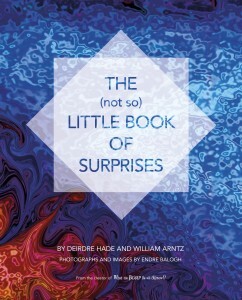 The (not so) Little Book of Surprises is a guide to one’s inner map of wisdom and awakening. I say to people, “I’m not really here, I’m a simulation. I’m from the grand projector, I’m beaming in.” My messages come from a state of Irradiance, which is defined as the ability to radiate outward an energy that is felt and/or experienced into the environment. (You can find this term in the dictionary.) I use this definition because when the Angels, the Light Beings, when God speaks to me, I feel a palpable presence, like a heaviness of light – my body changes. I go into a state of bliss and ecstasy, and then I hear their voices. I’ve worked very hard to be very clear to hear them and to make sure that the voices I hear are who they say they are. I then speak what they tell me, or I write it down. Surprises is a combination of my own wisdom, with what I’ve learned from God and the Beings of Light. It is my poetic understanding, and it is a combination of the Light Beings and of God sharing a greater reality perspective of our human experience. Surprises is a “children’s book” for adults. But it’s also very much a children’s book. I find children today are very aware, awake, and they’re looking to be validated for the wise souls that they are. More souls are being born right now have this high level of sensitivity. What I mean by that is, that they have an ability to feel and sense the natural world outside of the intellectual two-dimensional processing. These kids Know – and they’re being born by the millions. They want validation. They have come to help us heal our world. They come wrapped in a vibration of love. All children, are aware and sensitive, we must prepare a world for them to thrive. They learn differently, they need different kinds of schools, they need to be honored for what they see and what they know. The book Surprises is supportive for young people – it’s a family book to sit around and read together. I’m ecstatic with how The (not so) Little Book of Surprises turned out. I love reading it myself. Because of the through line that Will so artistically created. 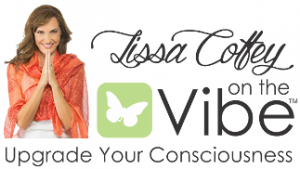 Each time I read it I experience something new – a spiritual experience of a different flavor. I actually learn, even though it comes from “my work.” I see something deeper every time. I’ve been asked, “Why read this book?” and I answer, because we are here as consciousness to experience the third dimension. We are here to create the magic, the miracle and the beauty – the justice, the truth – of what it really means to be human. And that’s our journey, and it’s bumpy ride. And we meet obstacles, but that’s really the journey of our human soul. And The (Not So) Little Book of Surprises was created for you to have an awesome experience in a book. There is no “right way” to pray. There is no “right time” to pray. Prayer is an ongoing dialogue, a soul connection with spirit, a fusion of physics and metaphysics. Prayer is our expression of gratitude, despair, longing, appreciation. It is one means of communication and communion with All That Is. Sometimes we’re praying and we don’t even realize it. Our actions reflect our thoughts; our thoughts are prayers. What are we thinking? What are we doing about it?